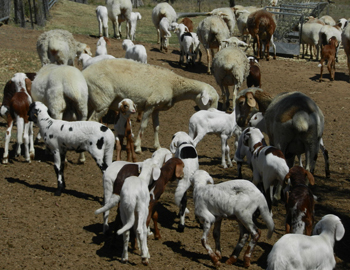 Thirteen years ago, in South Africa, a South African veterinarian took 100 embryos from pure Damara ewes owned by a leading South African Damara Breeder, Petra Scholtz. These embryos were frozen and exported to Australia, ending up with John and Mary te Kloot of "Marmboo" at Longreach, Queensland. These frozen babies were kept stored in liquid nitrogen for 12 years. Viv & Judy Forbes were aware of their existence and discussed their fate with John a couple of times. Sherana has one of the oldest and most varied flocks of guaranteed pure Damaras in Australia. So Viv & Judy were concerned that these Damara Ice Babies did not die. They were eventually purchased from John and Mary in 2012 and stored in Beaudesert. Next we looked for a vet with a good reputation for successful lamb implanting and eventually settled on a strongly recommended one, Francois Marais. We did not know Francois, and had never met him, but in a strange twist of fate, it turned out that he was the one who harvested the embryos in the first place, 13 years ago in South Africa. We then purchased 55 damara/dorper ewes from Wayne Squire of Inverell to use as recipients for the ice babies, emptied a shed, cemented the floor, built temporary yards and gave the ewes some training in the yards. 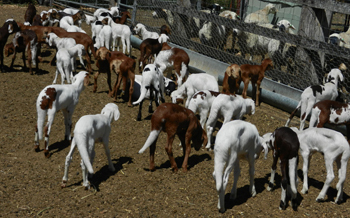 We got lots of good advice on the whole process from Dorper breeder Rosalie Smith of Galaxy White Dorpers. We gave preparatory needles and other procedures and organised helpers, nurses and cook for the day. The implanting operation occurred on 30 April 2013 and took most of the day. The first Ice Baby was born on 16 September and the last on 24th September. 100 embryos and 55 recip ewes were purchased. 97 embryos were implanted in 50 ewes, mainly as twins. 49 lambs were born. 4 were born dead or died soon after. Two ewes prolapsed. One orphan lamb was sold (as a wether) and one orphan ewe is being bottle fed. There were 16 sets of twins and 13 single lambs born. We now have 44 live Damara lambs from the 100 embryos. 45% of the 97 embryos implanted were successfully born. We hope that 24 damara ewes and 20 damara rams will be raised from the whole operation. We are pleased with the results of the program and now have a big infusion of new blood, possibly the last Damara genetics that will get into Australia from Africa. We have not yet been brave enough to work out the cost per lamb on the ground.